The UTX is a line of lightweight dynamic leg braces. This line is characterized by smart innovative solutions with eye for comfort and cosmetic. We try to give you maximum functionality with minimal resources. For a leg orthesis (also called a splint or brace) it’s ofcourse about standing and walking. With a UTX we try to realize a stable, secure, but also dynamically as possible gait for people who can not stabilize the leg themselves properly. But walking ok is not enough for the designers of Ambroise. How about for example donning and doffing the orthosis or getting in and out of a car? People are for example sit more than they stand and walk, so why wouldn’t that be for our UTX users? That’s why we at Ambroise think about sitting and other normal daily activities. That is why for example, all the UTX orthoses are provide with soft bandage at the rear side of the upper leg instead of hard shell parts (as is currently done with many conventional leg braces). Much more enjoyable when sitting and leads to less worn out clothing. In addition, the UTX is provided by a (designed by us) slim quick release, which lets you quickly close and open your UTX bandage. So you don’t have to search every day for the proper tension on the bandage. The UTX SWING orthosis (one of the embodiments of the UTX) was the first orthosis in the world which stabilizes the leg, if necessary (while standing and during the stance phase of walking), but leaves free when possible (during the swing phase), so that walking with a natural knee flexion becomes possible again. Many people at that time could not believe that this could have be designed at a small company from Enschede. Over the years, the UTX line continuously improved and expanded. Partly because of this, the UTX orthosis is still one of the most innovative leg orthosis world wide and the flagship of Ambroise. There are different embodiments of the UTX orthosis which can also be partly combined with each other. Click here if you want to know what different types and possibilities there are. You will then see a comprehensive overview of the many features of UTX. An anthology of some commonly used version is shown below. but also unfamiliar diseases such as IBM (Inclusion body myositis) or nervus femoralis neuropathy may be underlying causes. Characteristic is however that there is always loss of control over the quadriceps (femoris muscle), so that the knee can no more be well stabilized and walk is problematic. A UTX orthosis for you? There are several embodiments of the UTX orthosis depending upon the precise needs of the client. Which version is most appropriate depends on your situation from a few factors. A good anamnesis is important. There will be looked at your request for help, to your limits, but also your rest functions. Also your personal situation with regard to housing, employment and hobbies can affect the choice of the most suitable solution for you. Or contact us to learn about the options to get an UTX in your region. Your local orthotist and physiatrist can also indicate whether the UTX is a viable option in the treatment of your situation. If you want more information about the Knee Ankle Foot Orthosis, or if you are wondering if the UTX could benefit you, call us today on or read more on this page about the trial session of the UTX-orthosis means. How to get a UTX orthosis? if it turns out that a UTX orthosis is a convenient feature for you, it has to be made. This is done via a fixed stages. Click here to learn more about the different stages you have to walk through if you get a UTX orthosis. Hinge padding A nicely looking and perfectly tailored soft padding on the hinge prevents damage to clothes and furniture when you bump agains the hinge. 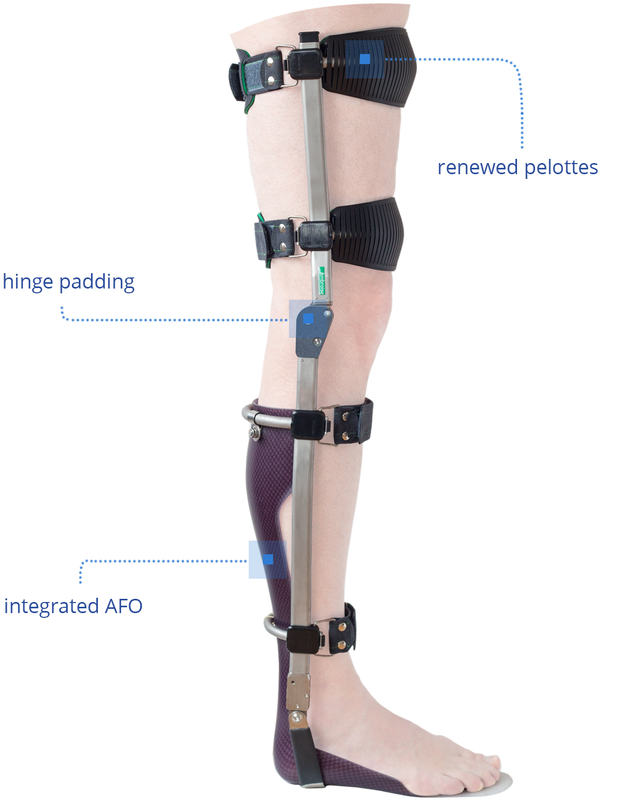 Integrated AFO It is now possible to integrate an Ankle Foot Orthosis (AFO) with a UTX. As a result, a wider range of problems around the ankle and foot and can be resolved in combination with the UTX.